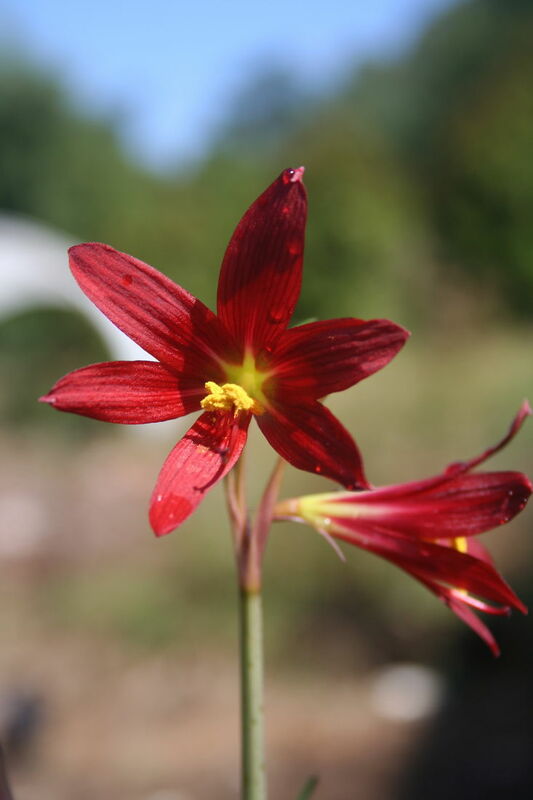 These members of the Amaryllis family containing about 30 species are close relatives to Hippeastrum. They are all native to South America, particularly Chile. They produce umbels of trumpet shaped blooms of cream, yellow, pink to red, through Summer and Autumn depending on the species. Stems vary in length from 10cm to 20cm and leaves are narrow strap shaped similar to that of Habranthus. Plant in a well-drained sunny spot with a small amount of blood and bone. Top dress with a slow release fertiliser and potash in early Spring. Keep just slightly damp over Winter to give them a “dry’ rest period needed to promote next seasons flowers. Suggest planting them near trees or shrubs, but ensuring the they get sunshine, that will help to keep them drier through the Winter months. Increase the water as the weather starts to warm up in Spring, then water weekly until the end of Autumn. Some protection from frosts in colder areas is recommended. They make a very lovely pot specimen and it is also easier to monitor the amount of water they receive during the Winter.